Nobody wants to get the “cold shoulder” but until symptoms appear very few people worry about getting Frozen Shoulder Syndrome (FSS). Estimates say it will strike about one in 30 people. Frozen shoulder syndrome is also known as “adhesive capsulitis” and can be both disabling and painful. Frozen Shoulder Syndrome can happen at any age although it is most likely to happen between the ages of 40 and 60. Strangely, it usually strikes your non-dominant arm. At Canberra Spine Centre we offer holistic and non-invasive treatments for FFS. In FSS the shoulder joint capsule (a sac of ligaments surrounding the joint) becomes inflamed and stiffens, which restricts shoulder mobility. Arm movement becomes extremely limited and the smallest movement can result in great pain. FSS usually affects only one shoulder, but in one in five cases, it affects both sides. Frozen Shoulder Syndrome more often affects women and diabetics. It can also be associated with other medical issues including hyperthyroidism, hypothyroidism, cardiac disease, and Parkinson’s Disease. FSS can last up to several years if there is no intervention. 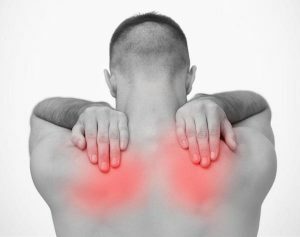 It normally begins with the “freezing” phase during which your shoulder becomes painful and gradually loses flexibility. In the “frozen” phase the pain decreases but the stiffness becomes so intense that the shoulder can barely be moved. In most cases, thankfully, during the “thawing” phase the shoulder begins to relax and pain and stiffness slowly fades away. But each of these phases can last 8 months or more if left untreated. Frozen Shoulder Syndrome can be difficult to diagnose because it often occurs without any obvious trauma, or only a very small injury. It also has much in common with other medical conditions including rotator cuff strain, cervical radiculitis, and bursitis or tendonitis. When symptoms become serious, patients are often prescribed a regimen of physical therapy as a general approach to joint pain. The effectiveness of physical therapy may be limited, and scans often reveal no joint, tendon, or ligament problems. Because of its ability to move in many directions, the shoulder is a common site of strain and pain. The more complicated a joint is, the more things can go wrong. The shoulder joint has a thin protective lining that can be damaged, shrink, stiffen, or thicken. Specific causes of Frozen Shoulder Syndrome are unknown, although patients typically mention previous shoulder trauma. It can happen after injury or overuse, or be related to other diseases. In FSS the tissues around the joint stiffen, scar tissue forms, and shoulder movements become difficult and painful. Treatments for Frozen Shoulder Syndrome are varied. Physical therapy can be effective, depending upon the method. Stretching alone is helpful, but slow. Steroid injections may help break down scar tissue and facilitate better movement, but more than one or two of these can cause damage to the joint. Surgery is a last resort. While for some people it is the only option, all surgery carries substantial risks. Canberra Spine Centre offers treatment for many different conditions including FSS. Nerves that service the shoulder joint begin in the neck and there is a complicated relationship between the muscular and skeletal systems of the back, neck, and shoulders. We will examine your neck for vertebral subluxations that might be affecting your shoulder function. Restoring proper movement to the spine improves nerve function to not only the muscles moving the shoulder, but also improves the sensory apparatus controlling motion. Both of these are factors in good shoulder function, and hence recovery from any injury. Lastly, restoring proper spinal motion improves mechanoreceptor (movement sensation) input into the brain, helping to block and reduce the damaging effect of chronic incoming pain messages. This often helps people to be able to move more freely and allow them to do the necessary rehabilitation without being hampered by so much pain. As with any extremity (part of the body away from the spine) problem, our approach is always to deal with both ends of the problem – the nervous system, or control end, as well as the extremity itself. At Canberra Spine Centre, when working with FSS, aside from work on the spine and nervous system, other aspects of the treatment may include adjustments to restore proper motion to the shoulder joints (there are several); soft tissue techniques to restore proper function (ie strength and length) to the muscles; and appropriate rehabilitation exercises to speed recovery. A recent study of the case files of 50 patients with FSS1 who were given chiropractic treatment was conducted between 2007 and 2008. This study discovered that in 16 patients all symptoms were resolved and complete motion was restored to the shoulder. Another 25 patients achieved 75% to 90% restoration of motion, 8 patients showed 50% to 70% improvement, and only one patient did not benefit from chiropractic treatment. What can Canberra Spine Centre Do? Chiropractic treatment at Canberra Spine Centre is a holistic non-invasive form of health care that restores proper function to the nervous system, helping the body to heal naturally. Using spinal adjustments, chiropractic treatment applies precisely calibrated force to specific parts of the spine to restore proper motion and thus facilitating proper nervous system function, helping your body to recuperate on its own. At Canberra Spine Centre we are provide non-invasive and drug-free treatments for many conditions, including Frozen Shoulder Syndrome. Drugs and surgery certainly have their place, and can help people in dire need. Our aim is to help people recover before they get to that point. If you or anyone you know have symptoms of FSS let us at Canberra Spine Centre do an evaluation. A Chiropractic approach can be effective in helping people recover from FSS. While FSS may take a long time to heal, we can generally speed up the process, as well as significantly enhancing your overall condition through spine and nervous system care.